One of the major obstacles associated with Neurofibromatosis is obtaining knowledgeable life-long clinical management for the medical issues that NF can cause. Individuals affected by NF need the care of one of the limited number of NF medical clinics. These NF clinics have the resources and expertise to treat the particular medical problems associated with NF. We seek to connect all individuals with NF to a clinic that specializes in the treatment of NF. Our health care system provides little assistance in finding the best medical care. Families are faced with the daunting task of trying to understand the pertinent medical issues and finding specialized care. Government publications point out that people can educate themselves and find the best health care professional by contacting patient advocacy groups like the Neurofibromatosis Network. The NF Network is aware of this shift to “consumer-driven care” so we have implemented a new program called NF1 Clinical Care Options. 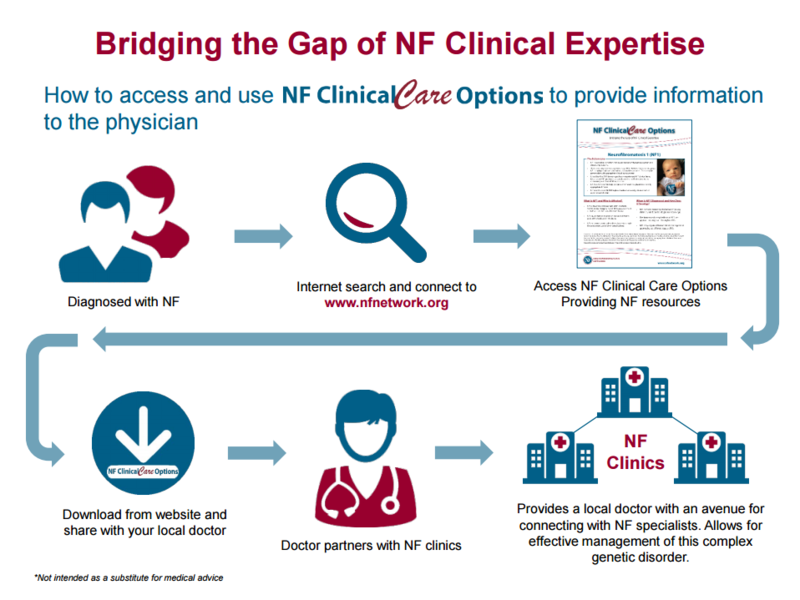 NF1 Clinical Care Options can help you bridge the gap of care between the local physician and the experienced NF1 practitioner. For the NF individual who has not had access to NF Clinics, we have published a comprehensive, scientific publication created for the express purpose of improved clinical care. Designed for both the patient and the local physician, often with limited NF knowledge, it includes information on the diagnosis and development of NF, specific tumor types, and a list of Neurofibromatosis Clinical Trials Consortium clinics whose practitioners, collectively are up-to-date on available treatments and who have agreed to be contacted by clinicians to learn more about NF or to refer a patient. 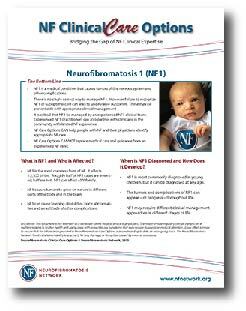 It is critical that NF1 be managed by an experienced clinical team. It is our hope that through the NF1 Clinical Care program we can help to obtain such excellent care for all NF patients.